Click on each service to toggle on/off the details to each service. Worm – A worm does not need to attach itself to a program, but can spread to files without even corrupting or modifying a single file. Worms are known to consume internet/network bandwidth spreading itself to any and/or all locations that it can. A good anti-virus program and a firewall can help protect you from a worm infecting your computer and then spreading. One can catch a worm from internet browsing, email, or simply having your machine turned on while on a network with another computer that is infected with a worm. Trojan – A Trojan or Trojan horse is a virus that most commonly gets into a computer system and gives remote access to the infected computer to perform tasks like display unwanted advertisements or pop-ups, send information about your banking or credit card, or even download or upload files to or from the infected computer. This is not the limitation of a Trojan and a Trojan can do many more things. The name comes from the Greeks that used to the Trojan horse to get inside the walls of Troy to be able to defeat the Trojans. Also similar to how a computer Trojan works. Trojans can infects ones computer system via third party software installation, email attachments, malicious websites, or even application exploits such as web browsers (Internet Explorer or others), media players, Instant Messaging, etc. One can help protect themselves with the use of an anti-virus program, an anti-spyware program, and cautious email and internet surfing. Rootkit – A rootkit is a type of malicious software or malware that gives one administrator level control over a computer system to gain access to aid in computer virus writers, steal or falsify documents, damage the boot sector to stop the computer from even booting up, or even use one's computer to share documents, videos, music, pictures, etc., to a person or group of people. One can become infected with a rootkit through viewing a video or other types of files accessed by a user through many common types of applications. One can protect themselves from acquiring a rootkit by the use of an updated antivirus program running real-time protection. Password Stealer/Key logger – A password stealer comes in a couple different forms, but mainly by capturing strokes to your keyboard. Once a keylogger has been installed, the keylogger can send back to a host each keystroke a user makes. When the host receives the information from the keylogger, the host searches for any possible user names and passwords (including but not limited to bank logins, Operating System logins, etc.) to gain the access desired for criminal activity. One can catch a password stealer/keylogger, by accidently installing one from website traffic, email usage, or through other malicious software. A keylogger can be searched with anti-spyware programs, and possibly removed. Browser Hijacker – A browser hijacker takes a web browser (internet explorer), and sets the home page to a particular website, and cannot be replaced back to the user desired home page. The hijacked browsers home page will most likely return after a reboot. The traffic to the site the hijacked browser is sending a user to could very well be loaded with advertisements which benefit the webmaster in payment for the hits to that site. One could become infected with a browser hijacker by certain websites that trick a user to install, or even by email. An anti-spyware program that is updated can possibly find and remove the browser hijacker from the system. Rogue Security Software (scareware) - Rogue security software is a type of malicious software that looks like a real security program that tells the user that there are infections on their computer and that if they wanted to clean the infections that they need to purchase the program to remove that false infections found on their computer. Rogue security software can install other malware onto one's computer as well. Rogue security software can be distributed through websites and emails. Usually Rogue security software makes it passed anti-virus programs, and can be detected by an anti-spyware program, possibly cleaned. 1. Number one will be the obvious…Make sure that you have an anti-virus program installed on your computer. An anti-virus program will scan files as they are opened on your computer for any viral contamination. If a virus is found, it will put the virus into Quarantine where it won't affect the other files on your system. Many people have their preferences on what virus program to have on your/their computer, but I personally care for the anti-virus program that update more frequently. Virus definitions are definitions that tell your anti-virus program what a specific virus looks like. 1000's of new viruses are made every day. If your anti-virus program doesn't know how to identify the virus then it will not be able to catch the virus before it infects your computer. With updating your anti-virus program more frequently you are better protected against viruses and newer viruses that another anti-virus program who is not updated. Windows updates offer protection to security threats via worms, Trojans, and other vulnerabilities. Take the blaster worm from a few years ago. This bug was fixed merely by doing an update with windows. This did not even require an anti-virus program to protect the computer. By using Google Chrome, Mozilla Firefox, Safari, Opera, or the like you are enhancing your protection from viruses, spyware, and any other malicious software. Internet Explorer is more susceptible to catching a virus than the others for marketing reasons. It is more worth it for someone to make a virus or spyware for an internet browser that is used by a FAR greater number of users than an internet browser that is used by few. You can catch something by using another browser, but the possibilities are FAR less. Some sites may require you to use Internet Explorer, but it is recommended to use this ONLY for those trusted sites. Some websites, take this site for example, will display features not available with another browser. For example, this site under the Digital Artwork section will blink "Portfolio additions will be coming soon!!!" under Firefox, but does not blink in Internet Explorer or Google Chrome. People who write viruses and spyware are going to try every trick in the book to get you to install their worms, Trojans, spyware, or any other malicious software that will open vulnerabilities to your system. One of these ways is to trick you into thinking you have a virus or many viruses. So, they will make the pop up saying to clean your system to "click here" to remove the items. Once you have done that, you have just installed the virus or software that they want/need you to install to give them the permission to get what they want from your system. These pop ups can come in many ways other than you have a virus or spyware on your system. Good rule of thumb is that if you did not click on a link to that pop up site, then you need to avoid that window. Of course, trusted sites (provided that those sites are not phishing sites) are an exception to the pop up rule. Emails from people that you do not know can result in getting a virus. People will try to deceive you by subjecting the email as "Hey Friend," "Did you get my email," or even a "re:"subject."" These emails are potential to having a virus attached or a phishing site link inside. Flash drives or external drives can have viruses inside them. Even worse, they can have a virus that gets activated when your operating system tries to "AutoPlay" the device. Once the operating system AutoPlays the device, the virus has the potential to spread not only to your computer and any drives attached to the computer, but to any computer or drives on your home network. As described before about pop ups, I would like to stress getting into the habit of closing internet browser windows by right clicking the window on the task bar and selecting close. By using this method to close the window, you are avoiding the accidental installation of a virus, spyware, or any other malicious software on your computer. Peer to Peer programs, or commonly known as P2P, are programs where you are networked in with many other people to download music, programs, pictures, videos, etc. These programs increase the possibility of getting a virus. If someone has a virus on their computer and it infects the file that you want to download, then the virus will be spread to your computer, and again possibly across your home network. There are many P2P programs out there, but the most popular is Limewire. If you use an account that is not an administrator account, you are limited to what can be installed onto your computer. This does not mean that your account name is Administrator, although this account is VERY much included to this idea. NEVER use the Administrator account on your computer. If your account name is John Doe, this account can have administrator privileges. You can find out if your account is an administrator account by going to your control panel and selecting User Accounts and in Windows XP seeing "Computer Administrator" under your user account. In Windows Vista or Windows 7 you can go to control panel then select User Accounts then select manage user accounts and see if your user account is listed Administrators under the Group Category. You can change this by highlighting your user account and then clicking the properties button. 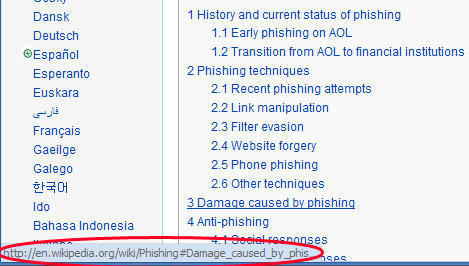 Phishing sites are websites that look EXACTLY like the site that you are trying to go to. For example, one may click on a link to their bank, and then their web browser (Internet Explorer, Mozilla Firefox, Google Chrome, Safari, Opera, are some examples of web browsers commonly used by the public) takes them to a site that looks exactly like their banks website. Logos, login, and everything else that their bank has on their site for style and appearance looks exactly like their banks website. If one looks up at the address bar, they will notice that the address is not the exact site when they normally type in their bank's address. Usually people get links to phishing sites via email. One would receive an email asking them to update their password or some similar request by "their bank." When someone does this, they are actually giving someone the credentials to their bank site. These people then use the credentials that you have given them to do some damage with their bank account. Example websites that are often phished are Bank of America, Chase, Citibank, Wells Fargo, PayPal, IRS, DMV, MySpace, Facebook, etc. In MOST cases, your bank will tell you that they will never ask you for your user name and password in an email, nor to request you to change it. If you suspect a phishing attack on your computer, seek assistance before you log into your bank or any important website that contains finances, any personal identity displaying websites or credit card information stored websites. Always pay very close attention to the links that you click on. An example of cautious web browsing would be to watch your Internet browser at the bottom for the forwarding link address that's displayed BEFORE you actually click on the link. There are many spam filters out there, but the best one may be installed on your computer already. While spam filtering can reduce spam coming into your inbox, spam filtering can put an important email in your spam box. Even with a spam filter installed and active on your computer YourComputerPal still recommends looking through your spam box to search for any email that should not be there. Ask yourself, how many times has someone asked you if you had got their email and you replied with a no. When they say, "Check your junk folder or spam box," it was there. YourComputerPal recommends using your email rules to help fight spam. Guess what, IT'S FREE, and it is installed already!!! Simply make folders inside your inbox of people, companies, organizations, etc, and set a rule for each folder created to send emails from those individual emails to go straight to the designated folder. Make another rule that identifies spam and designate those emails to go straight to a second check folder. BE CAREFUL, not to make a too general rule to go to the second check folder that someday you get a legit email with a word that you have identified as spam. Spammers are creative, spammers know how spam filters work and WILL attack those vulnerabilities. This process of making rules make take a little time to optimize, but they end result will be an organized email client with a limited amount of spam making it into your inbox. Please think twice before investing some of your hard earned money into a spam filtering program that you will just have to double check your junk/spam folder anyway. A lot of times I get asked what the best web browser to use is. I always tell them I stay WAY far away from Internet Explorer unless the site requires me to use Internet Explorer. A site like that is the ONLY time I would ever use it, for security reasons. I tell them that I use Mozilla Firefox for "better" security reasons. It is less prone for spyware to get installed onto your system. Also, there is just something about a software that support updates the software as often as Firefox gets updated. That tells me something about the software. But, if you are specifically looking for a reason to switch to something else, here is a good article done by www.tomshardware.com about the benchmarking of the top web browsers available to the consumers that are free. With this conclusion you can determine which browser would be best for you! I, personally, use Google Chrome for speed reasons. It is a lot faster than the others, more secure than Internet Explorer, and I like the functionality of Chrome.